A soil amendment is any material added to a soil to improve its physical properties, such as water retention, nutrient holding capacity, water infiltration, drainage, aeration and structure. Urban soils are often altered and become unfavourable for tree growth and development. The soil may be compacted or have a disrupted soil profile, elevated pH, chemical contamination or subsurface barriers as the result of building foundations or roads. The biological makeup of urban soils is typically very different from soils found in natural woodlands. The goal of soil amendments is to provide a better environment for roots. 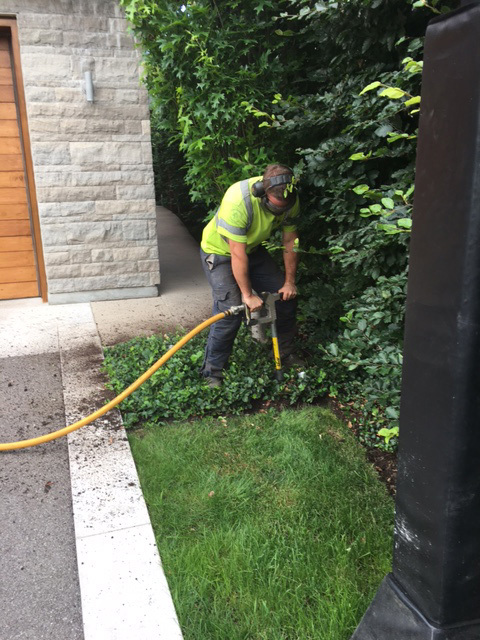 Aeration vertical mulch is advised for young trees already planted into compacted soil with little organic content or established trees that have suffered soil compaction. It enhances the rooting environment in order to stimulate better root growth. This process involves drilling 2″ diameter holes at 2 ft. spacing and to a depth of 12-14″. The holes are then filled with a mixture of organic matter, fertilizer and mycorrhizae (beneficial fungi).